So, you can add (as descibed here on the Time Life Archive page) to the "... iconic moments of the 20th century, where you will find Alfred Eisenstaedt's sailor kissing nurse in Times Square, Margaret Bourke-White's Chrysler Building gargoyle and Gjon Mili's picture of Pablo Picasso "painting" with light, to name a few...." all of Sports Illustrated's imagery. It too is now in the hands of Getty Images (NYSE: GYI), with an announcement imminent by SI Pictures, but the deal was signed last month. I'm guessing they didn't want to announce it too close to April Fool's Day, because they'd have egg on their face as people laughed and said "oh come on, it's not 4/1 yet!" 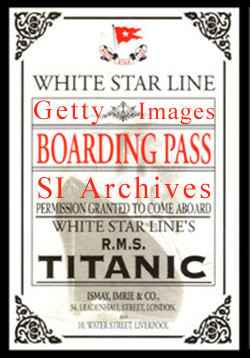 It seems that SI's archive has been languishing a bit, so the geniuses that thought they could monetize the collection are now looking to Getty and their rapidly diminishing interest in editorial/creative (as reported here - Fool's Gold - Getty Images' Future, 4/1/08) to somehow save them. Let's see, Captain Smith, where would you like those deck chairs again? Just substitute deck chairs for server blades full of sports imagery, and you begin to get the point. Truth be told, the deal, inked in early March, was held off because they wanted to spring the H&F purchase announcement first, without causing a ripple in the sale of GYI. Interestingly enough, this is more about protecting the imagery (supposedly) from others, BUT, Getty has some major sales goals they have to meet. Don't think though, that Getty won't intersperse the search results with their own wholey owned content, and maybe, just possibly, goose the results to "just meet" their sales objectives/requirements. I wouldn't put it past them, that's for sure. Interestingly enough, Getty has in their deal with the sports leagues rights that allows them - with certain restrictions - to sell their sports imagery for commercial/advertising purposes. Why? Because the leagues get a cut. And, this was one of the things that Getty was holding over the SI folks' heads - that SI could only sell editorially, but through Getty, those images - at-least of major league sporting events (which GYI has contracts with) - could be sold in a commercial fashion, for big big dollars. It's amazing that SI Pictures would take a premium brand and allow it to be dilluted by Getty's flacid pricing structure. Anyone who needs sports imagery of the caliber of SI's already knew where to get it. Good Luck SI, you'll need it. Remember, when push comes to shove, and there's a shortage of lifeboats, it's women and children first. It's a crazy world we live in these days that some people believe whatever is in a "press release". Today, the prankster's favorite day, a prank was attempted on the stock photography industry. Norway and the US are among the countries that celebrate April Fools Day, and one Norwegian company has taken to spoofing those in the US with the "news" that Crestock has aquired Corbis for $625 million. In fact, they even list it in their "news room" section, here. Yet, a review of the Corbis news room, here, shows no news reported. Me suspects tom foolery all around! Biggest give-away? At the bottom of the Crestock release is reads "Additional information concerning these and other risk factors is contained in Crestock's and Corbis's most recently filed Forms 10-K and 10-Q." Yet, neither company files these forms. UPDATE: While not to be believed, supposedly, Corbis was contacted by Crestock to say their site was hacked (yeah, right) and someone posted this "news" blurb, and they haven't been able to get rid of the blurb all day. Mmmm Hmmm. What idiot writes site code and then loses sysop access? I've been writing code since 1984, and that was a basic principle of every program I ever wrote - don't get locked out of your own code. Methinks Corbis is enjoying this little trickery. Maybe I should have titled this post - "I call Shenkanigans!" Getty Images: The Long Road To A Sale; Interest Waned As Process Went On. In 2008, Getty projects that 51% of their revenue will come from Creative Stills, and that, four years from now, that will plummet 43%, to 29%. So, if you're a Getty image producer in this department, this means that your income over the next four years will drop by 22%, even so as your cost of doing business increases over that same period. In 2008, Getty projects that the editorial department will only see growth of just 4% over the next four years, for 20% in growth. Not so good when you look at the margins below. Consider that this is one of those departments likely to disappear. In 2008, iStockphoto accounts for just 15% of Getty's revenue, which will grow about 50% over the next four years, to 22%. Between 2008 and 2012, the music and footage/multimedia sees astronomical growth - relatively speaking. Music grows by 200%, Footage/Multimedia grows by 50%. Worse yet, In 2008, the Gross Margin (that is, the gross difference between total income and net sales) will plummet from 53% to 31% by 2012 for Creative Stills as well, a comparable figure. In other words, don't look to efficiencies to apply to your business of creating images that go to Getty to offset your 22% revenue loss, you'll still be on the losing end of a losing proposition. In 2008, for Editorial, the gross margin will only increase by 5%, comparable to that of it's revenue. In other words, there will not be a substantial leap from revenue to margin for this division. That's not likely to be sufficient for the new owners to keep it around. On the other hand, there will be a 70% increase in margin for iStockphoto (moving from 13% to 22%), as more and more people contribute, and the costs associated with paying out $0.20 or so per image will decrease. This is remarkable, as Getty will also see that 57% growth in revenue (from 13% to 22%), meaning that iStockphoto will command more and more attention of those rearranging Getty's deck chairs. Further, there will be a 200% margin growth in B2B Music, and a 50% margin increase in footage/multimedia between 2008 and 2012. Take a hint from what happened with AOL and Time Warner. Back in the heady days of the dot-com 1.0 era, AOL was the one who bought Time Warner. Now, it's Time Warner who is looking to jettison AOL, or, at the least, the losing propositions/divisions of AOL's from days gone by. Beware the day that Hellman & Friedman trashes everything that does not meet it's margin standard, and sells off iStockphoto/Pump Audio/et al along with much of the wholly-owned Getty imagery as a nicely wrapped up deal under the iStockphoto brand. Don't think so? 11 months after iStockphoto.com was registered as a domain name, iStockaudio.com was registered - check here. It was renewed January 9th of this year. You see - PumpAudio becomes iStockaudio.com, iStockphoto.com gets an infusion of the best of Getty Images, and oh, their video footage gets wrapped up in iStockvideo.com, which was registered late back in 2003, but was renewed on the same day as iStockaudio.com was - January 9th of this year. Check the Network Solutions registration information here. All if it, of course, wraps up nicely and neatly into the iStock.com URL, which will likely serve as the central clearing house for all three. Registered way back in 1995, it was renewed on, you guessed it, January 9th, 2008, as seen here. Thus, this April Fool's Day the only true fools will be those that fall for the Getty Images line about how great things are, or will be in the future. I see the light at the end of the tunnel, but know enough to lay between the tracks to avoid the freight train that will crush anyone standing in it's way. 2/26 - Getty Images - A New Beginning? 2/22 - JDK - Getty Images' CEO and KKR's Track Record - History Repeats Itself? 1/21 - There's a sucker born every minute - Getty Images For Sale! So many Idiots With Camera (IWC) go out, and make our lives more difficult. Whether acting up on TV, or being unprofessional in the execution of our photographic duties, the world sees us as less and less a professional, and more and more a nuisance. Recently, I received information on two separate, and distinct demonstrations where professionalism was lacking, or simply devoid. The first was the fisticuffs that took place while paparazzi were covering the arrival of do-nothing heiress Paris Hilton in Turkey. Paris was busy trying to recover her image, as if she had one to begin with. Yet, the assembled photographers and videographers can be seen here throwing fists, and if you look carefully, you can see one TV cameraman using his $30,000 camera as a weapon, hammering down on an unseen victim. The second is the situation where a wedding photographer was found to not deliver professional results - in fact, results not consistent with the portfolio they presented. (PhotoResearcher, by Joel Hecker, Esq) Further, the photographer did not deliver on the terms of the contract. Specifically, they did not bring an assistant they had said they would. Thus, they were found to be in breach of contract for this, and other reasons. In an odd way, there are benefits to these incidents. Perhaps, people will become more discerning when they select a photographer. When I get a call from a 5-star hotel who wants to send me their "vendor agreement", which dictates how we may act, and comport ourselves while on site for the event (press conference, wedding, and so forth) and they require us to provide proof of insurance, I smile and send along the appropriate documentation, knowing that at-least 75% of my competition just got nixed from consideration, or, perhaps, when it's a last minute call for an event at those same venues, it's because other photographers (among that 75%) got nixed after the client had signed them because they could not meet the terms of that vendor agreement. It's surprising that I am among the minority of photographers who have liability insurance. One lost job is more than enough revenue to carry that insurance in the first place. Over the years, I have covered countless movie premieres and events, and worked with many many A-level celebrities. It's easy to illustrate how we are different - ney professional - and clients fear the possibility of hiring an unprofessional photographer who does not know how to co-exist amongst the VIP's at their event. I recently received a call to travel to five countries this Summer over 12 days, for a premiere project. The client has indicated to me, when I asked "who have you used in the past..." responded about the trials and tribulations of working with an unprofessional photographer. This five-figure assignment was won not because I was the most talented with a camera, or because I had the best eye/vision, but because I have a track record with this client of being professional as I make my images. Would I love to have all my assignments conveyed to me because of my unique vision? My creative capabilities? Absolutely! But, in the end, I am more than happy to that the assignments that come to be because I am 1) the only one available; 2) I was the only one who called back; or 3) I was the only one who had the right professional attitude to accomplish the assignment. I see often clients who come to work with me, and then, for no apparent reason, stop calling. Then, they start calling back again. Over time, I've learned that these clients get lulled into a false sense of security thinking that the service level I deliver is comparable to that of others in my community who deliver at a price 30%-40% less than me. So, for a few hundred dollars, clients go elsewhere. Soon, they learn that there is a difference, and they return, with a new understanding and respect for a level of service that they expect on a continuing basis. These clients remain, over time, and are among my favorite long-term clients. Some of them have been calling on me for over 15 years.